I have been taking photos of food for years. I can’t remember when I started. Therefore, I have a huge collection of food memories to share. And because my fondest food memories were during my trips to Taiwan, I’ve decided to begin a showcase of Taiwanese food. This is something I always have to get whenever I see it – the ice cream spring roll. 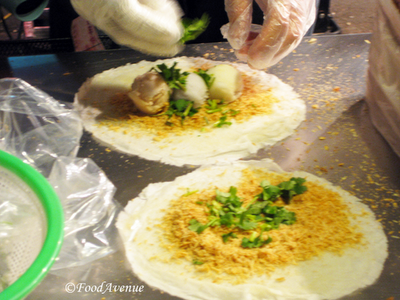 The one below is from the Tonghua Night Market in Taipei City. This particular vendor makes the best ones I’ve ever had. 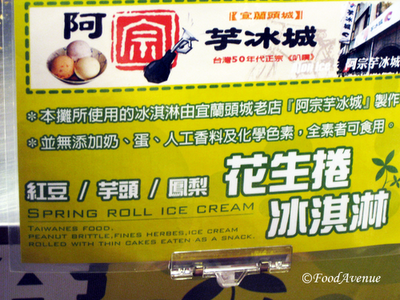 For the uninitiated, the ice cream spring roll (or spring roll ice cream, as it says on the sign) consists of peanut brittle shavings, some coriander (optional), and three scoops of ice cream wrapped up in a popiah "skin". For a demonstration, here is a youtube video of the process. You can even customise your ice cream spring roll! The vendor will ask you if you want ice cream (in pineapple, taro and peanut flavours), if so, which flavours (all the same, one of each etc). They will also ask if you want coriander. I prefer mine with one of each flavour of ice cream, plus coriander. It's an unusual dessert burrito, of sorts. The crispy texture of the peanut brittle shavings contrasts with the soft, smoothness of the ice cream (which is more like gelato, less creamy, punchier flavours and very refreshing) and then the coriander takes it to a whole new level. It's truly an intriguing taste sensation and is definitely one of my all-time favourite Taiwanese night market foods!Would you try it if you had the opportunity?? Leave a comment and let me know! 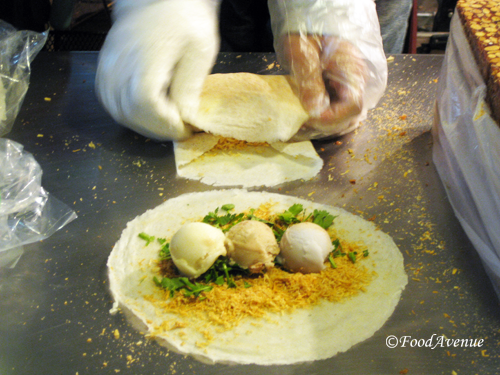 Or if you've tried ice cream spring roll before, where did you get it from?